We’d love your help. 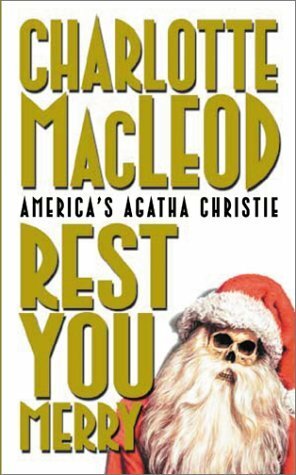 Let us know what’s wrong with this preview of Rest You Merry by Charlotte MacLeod. Professor Peter Shandy finally succumbs to Jemima Ames, Chairperson for Balaclava Agricultural College's major fundraiser, the Grand Illumination. He buries his small brick house under an avalanche of tawdry plastic and escapes on a sea cruise. But he returns to find Jemima dead on his living room floor and a murder to solve. To ask other readers questions about Rest You Merry, please sign up. I adored the late Charlotte MacLeod’s Kelling series so, so much that I devoured all 12 books and only wish she’d lived to write a dozen more. So when my book club, the Great Escape, suggested Rest You Merry, the first novel in MacLeod’s Peter Shandy series, as our December read, no one was more enthusiastic than I.
Curmudgeonly bachelor Peter Shandy’s a tenured professor of agrology at Balaclava Agricultural College in Balaclava Junction, Massachusetts. While he’s gone, the wife of his best fri I adored the late Charlotte MacLeod’s Kelling series so, so much that I devoured all 12 books and only wish she’d lived to write a dozen more. So when my book club, the Great Escape, suggested Rest You Merry, the first novel in MacLeod’s Peter Shandy series, as our December read, no one was more enthusiastic than I.
Curmudgeonly bachelor Peter Shandy’s a tenured professor of agrology at Balaclava Agricultural College in Balaclava Junction, Massachusetts. While he’s gone, the wife of his best friend, an interfering, overbearing woman named Jemima Ames, turns up dead in Shandy’s living room. Police declare Mrs. Ames’ death an unfortunate accident that occurred when she was trying to take down Shandy’s vulgar Christmas display; however, neither Shandy nor Ames’ husband Tim buy that explanation. Rest You Merrydoesn’t rank with the Kelling books, but the mystery cozy was pretty good, and I immediately downloaded the next book in the series, The Luck Runs Out, from the library. 4.5 rounded up. Wonderful first entry in the Peter Shandy series. I downloaded this book a few days ago because I was looking for a quick read to fit in before Christmas, and this one had good ratings. For me it was pretty mediocre. The characters felt pretty interchangeable and the mystery wasn't especially clever. Overall it was just okay and I don't plan to read more in the series. And I didn't even finish it by Christmas! Like, big puffy heart love. Like, more than I ever loved Gilbert Blythe love. He's a 56 year old professor at an agricultural college in Massachussetts. He's intelligent. He's snarky. He's compulsive. He's impulsive. He's also been such a private type that his colleagues and neighbors on campus didn't seem to realize some of these things until one particular Christmas season. Every year the campus puts on a massive festival called the Grand Illumination and all of the houses on campus (Shandy's included) are expected to participate. For years Shandy has refused, in spite of the constant badgering from the festival's committee members (especially the chair of the committee, who happens to also be his best friend's wife). After all, he refers to the event as the "Annual Fleecing" for all of the money it brought in from visitors. He wants no part of it. Shandy decides that her death wasn't the accident it looked like and ruffles more than a couple of feathers in trying to get others to pay attention. He's given orders to fix the whole mess by the college president, Thorkjeld Svenson. Svenson is a Viking in a suit. I keep picturing Donal Logue a la King Horik whenever he appears. The messier the mess gets, the more Horik-ish Svenson seems. I love it. A fun "who-dunnit" with a Christmas theme. Peter Shandy is a professor at the esteemed Balaclava College. During the Illumination, the yearly Christmas celebration on campus, Shandy stumbles onto not just one, but two dead bodies. When the authorities don't seem to share his sense of urgency, Shandy - along with help from the ever resourceful Helen Marsh - does some detective work of his own. While I felt this dragged a tad in some parts, I enjoyed the story as a whole and would like to read the A fun "who-dunnit" with a Christmas theme. First in the Peter Shandy series. Very funny. Set at the fictional Balaclava Agricultural College. Out of print, something different. Worth looking for. 1977, #1 Professor Peter Shandy, Balaclava Agricultural College, New England; murder of an obnoxious woman at Christmastime involves a quiet academic in sleuthing and affection; her first adult novel, it's filled with all the right stuff for a lovely cosy village-type comedy/mystery, plus a bit more. Three-and-one-half stars. Peter Shandy has had enough. QUITE enough, thank you, of being badgered and harrassed by the university's faculty wives, about participating in the college's annual “Illumi 1977, #1 Professor Peter Shandy, Balaclava Agricultural College, New England; murder of an obnoxious woman at Christmastime involves a quiet academic in sleuthing and affection; her first adult novel, it's filled with all the right stuff for a lovely cosy village-type comedy/mystery, plus a bit more. Three-and-one-half stars. Peter Shandy has had enough. QUITE enough, thank you, of being badgered and harrassed by the university's faculty wives, about participating in the college's annual “Illumination Festival”, an enormous display of holiday lights wherein all the faculty housing gets “beautified” for the holidays and the entire town and college staff and student population sell stuff and do peculiar things to raise money. Since the lavish displays and free actitivies draw lots of tourists and folks from nearby towns, it's one of the major income sources for the little agricultural college and everybody is expected to want to pitch in and help. He arranges for the most garish, loud and tacky decorations he can possibly obtain, and pays a bunch of men to come in on one day and put all of it up for him, including extremely loud, completely hideous renderings of “Cute! !” holiday songs played at full blast and locks up both his house and the fuseboxes for all the equipment. He then skeedaddles out of town for a nice cruise. But things go seriously awry, starting with the boat, which develops engine trouble, and Peter decides to go home and, er, face the music... He fully expects to be in big trouble over his stunt, but not as much as he actually gets into. When he gets home he finds Jemmima's dead body behind his sofa, the lights and music shut off, and the entire town talking about his display. This is a tidy, funny, look at peer pressure among academics, along with one-upsmanship ditto, and is filled with verbal sniping, lasciviousness amongst the faculty (and others), greed and hubris. We are introduced to a raft of wonderful characters. Peter, who is a grey sort of man at first but eventually grows into a much more colorful and interesting person. The President of the college and his wonderful wife, 'way over the top and lots of fun to “experience” but I wouldn't want to actually be in his path any time soon (I worked for a man very much like him and, believe me, it wasn't easy...). Miss Helen Marsh, librarian, who comes in to help out a friend of Peter's and winds up finding far more than she expected. Various nice friends and collegues; awful ditto. There are a lot of characters to keep straight but I've never had any trouble following Ms. MacLeod's stories. This was Ms. MacLeod's first novel for adults and she does it very nicely IMO. She gets a lot better, though, over the years. She published books for about twenty years and during that time wrote four series, each with many books, each distinctive in its tone and approach to mysteries. In this first mystery you can clearly see the debt she owes to past writers, especially Phoebe Atwood Taylor, another New Englander who in the 1930s and 1940s wrote humorous mysteries starring a laid-back, quiet-but-brilliant man (Asey Mayo series, set on Cape Cod). And her protagonist Peter Shandy is somewhat similar in occupation, attitude, and attributes to Jane Langton's Homer Kelly, a slyly funny New England mystery series that began in 1964. Ms. MacLeod obviously read those books and enjoyed them, but her creation of Balaclava College and Peter Shandy and friends is entirely her own. The ensuing books become more farcical but remain entertaining. If you enjoy a good cosy “village mystery” filled with peculiar characters, tidy plots, word play and a satisfying conclusion, you can't go wrong with any of Ms. MacLeod's four series; besides the Shandy stories she wrote (as MacLeod) the Sarah Kelling and Max series, Boston (#1 The Family Vault). As “Alisa Craig” she also wrote two series set in Canada, the Madoc Rhys, RCMP stories set in Canadian Maritimes; these are affectionately humorous but less broadly so than the Shandy stories. And the Grub'n'Stakers series, about an extremely peculiar gardening club in the middle of western Canada (Alberta I think, but don't hold me to it, it's been decades since I read the series) – it's the most farcical of her series although some of the later Shandy books come close. Obviously I'm infatuated with her writing, and justifiably so, IMO. It's smooth, intelligent, entertaining, and set in what is “local” for me. She is one of my all-time favorite mystery writers, and I was saddened when I heard she had to stop writing in the mid-1990s due to Alzheimers; she died a few years later, early 2000s I think. I miss her charming gentility, her way with words, her beautifully honed sense of the absurd. But she left us a big pile of wonderful stories to read, bless her! It's the night before Christmas as I write this review.The season is merry and I should be too. Yet despite best intentions and goodwill to all men, I couldn't bring myself to listen to this book again. The story is slow and the characters are bland. I don't care whodunnit or how they are found. Two hours of listening to lengthy discourse on marbles and murder and wrongly locked doors, with no tension and no action are more than enough. I'm setting it aside to read other stuff. Never fails to lift my spirits and make me laugh out loud! One of my favorite Christmas rereads, this is the first in the author's witty, charming, clever Professor Peter Shandy series set at a small agricultural college in rural Massachusetts. Quirky characters, literate and funny dialogue and a delightfully twisted murder mystery - what's not to love? 2018 - always makes me happy! 2017 - still five stars for me. 2015 - Always a favorite reread, still holds up and makes me smile and laugh out lo Never fails to lift my spirits and make me laugh out loud! One of my favorite Christmas rereads, this is the first in the author's witty, charming, clever Professor Peter Shandy series set at a small agricultural college in rural Massachusetts. Quirky characters, literate and funny dialogue and a delightfully twisted murder mystery - what's not to love? 2015 - Always a favorite reread, still holds up and makes me smile and laugh out loud in a few spots, fun! I try and fit in a reread every year, light, snarky, quirky and charming - I've read and recently reread the entire series, but this is definitely my favorite book of the lot. 2014 - One of my favorite Christmas rereads, I try and get to it every year - so much fun! This is the first case for Professor Peter Shandy of Balaclava College, a small agricultural school in rural Massachusetts. The back-stabbing, gossipy faculty, Christmas setting and sparkling, snappy dialogue are a real treat, and I wish I had Professor Shandy for a science class, he's adorably old-fashioned, funny and sharp as a tack - a great amateur sleuth! He gets a wonderful sidekick in this outing, as he wooes visiting librarian Helen Marsh in a charming romantic subplot that in no way takes away from the mystery. 3.5? The characters were kind of caricatures and the setting was kind of hard to identify (they kept talking about doing or eating things I identify as British but they seemed to be based outside of Boston). The local police didn't even qualify as a joke and I don't know if that's a product of the 1970s, small towns, or just bad research. I mean if someone is dead in someone else's house wouldn't an autopsy be kind of mandatory? The mystery wasn't an easy solve, I had suspicions about certain pe 3.5? The characters were kind of caricatures and the setting was kind of hard to identify (they kept talking about doing or eating things I identify as British but they seemed to be based outside of Boston). The local police didn't even qualify as a joke and I don't know if that's a product of the 1970s, small towns, or just bad research. I mean if someone is dead in someone else's house wouldn't an autopsy be kind of mandatory? The mystery wasn't an easy solve, I had suspicions about certain people but couldn't tie them together with any kind of motive. The ending was rushed, with an entire mystery solving trip totally untold. Also the depiction of housewives was insulting. 2.5 stars. A cozy murder mystery set at a fictional agricultural college in New England in the 1970’s, during the Christmas season. It’s not a bad read, just a little bland. It’s a contemporary novel, and there are only a few bits which let you recognize the time period, such as people literally dialing telephones, the mention of the library’s card catalog, and the assumption of which gender does the cooking and housework. There’s a nice collection of quirky characters living in a quirky college 2.5 stars. A cozy murder mystery set at a fictional agricultural college in New England in the 1970’s, during the Christmas season. It’s not a bad read, just a little bland. It’s a contemporary novel, and there are only a few bits which let you recognize the time period, such as people literally dialing telephones, the mention of the library’s card catalog, and the assumption of which gender does the cooking and housework. There’s a nice collection of quirky characters living in a quirky college town. The mystery is okay. It felt a little odd that nobody is particularly shocked or upset at the murder of someone everybody has known for years, but then this wouldn’t be so cozy if the characters were seriously distressed. The romance is sweet, but as it’s a case of love at first sight with absolutely no conflict or impediment, it’s not terribly gripping. Really liked this story. This series looks like it will be a fun one to read. Peter Shandy is a professor at an agricultural college. They area he lives in on the college grounds really goes all out for Christmas. Peter doesn't care to put up decorations. The ladies of the decorating committee are pressuring him so he comes up with a plan to put up hideous decorations and then leave town for the holidays. His trip doesn't go off as planned and he is forced to return home. Upon his arrival back ho Really liked this story. This series looks like it will be a fun one to read. Peter Shandy is a professor at an agricultural college. They area he lives in on the college grounds really goes all out for Christmas. Peter doesn't care to put up decorations. The ladies of the decorating committee are pressuring him so he comes up with a plan to put up hideous decorations and then leave town for the holidays. His trip doesn't go off as planned and he is forced to return home. Upon his arrival back home he discovers the body of one of the other residents dead in his living room. Peter doesn't believe it is an accident and decides to figure out what really happened. This is the first in Charlotte MacLeod's Professor Shandy mysteries. In it we are introduced to Professor Shandy and several of the recurring characters in this series. Although each mystery stands on its own, it does help to read this one first if you can so that you can get to know these characters. If you enjoy humor based on character portrayals, you will enjoy these mysteries. Cute, whimsical mystery that honestly put me more in mind of Dorothy Sayers than Agatha Christie. I wanted to read a holiday book and it was a pretty good choice. Professor Peter Shandy would like nothing more than to spend to spend a quiet Christmas away from the small college town of Balaclava Junction. Every holiday season this otherwise quiet neighborhood is transformed into a “Grand Illumination”, drawing tourists from far and wide, to see the beautiful Christmas displays in which each neighbor takes part; all except for Peter that is. Despite being hounded for years by busybody Assistant Librarian Jemima Ames he has silently refused to take part, hi Professor Peter Shandy would like nothing more than to spend to spend a quiet Christmas away from the small college town of Balaclava Junction. Every holiday season this otherwise quiet neighborhood is transformed into a “Grand Illumination”, drawing tourists from far and wide, to see the beautiful Christmas displays in which each neighbor takes part; all except for Peter that is. Despite being hounded for years by busybody Assistant Librarian Jemima Ames he has silently refused to take part, his house standing as the lone dark spot in another otherwise brilliant neighborhood display of holiday cheer. This year he has an idea, though. Before heading out of town he decides to have a little fun at Jemima’s expense, blanketing his house and yard in a loud and garish display sure to have her fuming. When he returns home he expects to find Jemima waiting for him with some stern admonishments. Instead he finds her laid out on his carpet....dead! The small town police chalk it up to a fall and don’t suspect foul play. The rest of the town seems content to put it behind them and get on with the Christmas festivities. Professor Shandy senses that something doesn’t feel right and takes it upon himself to try to solve the mystery of the dead librarian...before someone else is murdered. What initially drew me in when choosing a mystery to read was the setting (small college town during Christmas) and the cast of characters (librarians, professors etc.). I really liked the idea of reading a cozy mystery and this one certainly fit the bill (although alas, no cats). It’s got the screwball comedy sensibility of an episode of Northern Exposure or the wackier parts of Twin Peaks. The characterization is a bit thin with some of the characters fitting into immediately recognizable types (absent minded professor, nosy neighbor, etc.) but it works in the context of the book which goes for a light, playful tone. It’s primarily dialogue driven, so moves at a pretty quick pace. It also introduces a love interest for the budding detective Peter Shandy in the guise of incoming librarian Helen Marsh, which provides a nice secondary storyline. The first book in the Peter Shandy mysteries by Charlotte MacLeod, in a 10 book series. This was the audiobook edition narrated by John McLain. Peter Shandy, college botany professor, and librarian Helen Marsh Shandy solve murder mysteries in Balaclava County, Massachusetts. With the festive season in full swing at Balaclava College, professor Peter Shandy is not feeling in the festive spirit. After refusing to allow the Christmas committee to decorate his home on the hill for yet another year, he The first book in the Peter Shandy mysteries by Charlotte MacLeod, in a 10 book series. With the festive season in full swing at Balaclava College, professor Peter Shandy is not feeling in the festive spirit. After refusing to allow the Christmas committee to decorate his home on the hill for yet another year, he decides to take the Christmas break away from his normal yearly routine. But before going he decides to leave a little present for the Christmas committee that they will not forget! What he doesn't expect to find on his return is a dish of marbles scattered over the floor and the dead body of his friend and working partners wife and head of the Christmas committee behind his sofa! It looks like she slipped off the ladder trying to remove some of Peter's window decorations. The campus security and the local police are quite willing to put it down as an accident, but Peter thinks it is murder, when he finds that one of his nieces marbles is missing. So it is left to Peter, with the help of Miss Helen Marsh to find a killer within the college campus. Charlotte MacLeod story telling is light, fun and totally enjoyable. Weaving a magic of colourful characters and situations that will keep you glued to the page from start to finish. Ms MacLeod's books are ones I can enjoy many times over, and still get the freshness and the delight as I did when I first read them many years ago. John McLain's excellent narration kept the story moving with the lightness and fun that Ms MacLeod aimed for, and is well worth listening to. If you like the review and would like to read my other reviews on books I have read, visit my blog at www.finalchapterreadersgroup.wordpres...... like, comment and follow. This is the first Peter Shandy mystery, and the first novel I’ve ever read by the author Charlotte MacLeod. I only bought it because it was a Kindle $1.99 sale book and because I am always looking for new Christmas mysteries to read. This was mildly entertaining, but I cannot believe it was written in 1978: the way the characters speak and act, it feels like something from the 40s or 50s. The book is supposed to be a farce, and a send-up of American academia, and it does both these things in a v This is the first Peter Shandy mystery, and the first novel I’ve ever read by the author Charlotte MacLeod. I only bought it because it was a Kindle $1.99 sale book and because I am always looking for new Christmas mysteries to read. This was mildly entertaining, but I cannot believe it was written in 1978: the way the characters speak and act, it feels like something from the 40s or 50s. The book is supposed to be a farce, and a send-up of American academia, and it does both these things in a very broad and ham-handed way. I could have gone along with this for fun, if it weren’t for Shandy’s highly improbably love interest, Helen. She is so lovely and adoring and feminine in a Stepford-wife kind of way that even for a fictional character she seems unreal. Of course she agrees to marry Shandy by the end of the book, five days after meeting him. What is his secret? Why does every woman on campus, young or old, single or married, throw themselves at Shandy? He is 56, completely ordinary in appearance, and a lifelong bachelor set in his ways. He doesn’t come across as charming or charismatic in any way whatsoever, so what is the appeal? Peter Shandy comes home from an aborted vacation to find a very nasty surprise during the Christmas holidays. How can Jemima gotten into the house? Was her death an accident? And what happened to the missing marble? I thought this book was well written and certainly had a nice batch of suspects. Set in a New England college, there are your full contingent of nutty professors with quite a bit of academic tension which, according to anecdotes, is pretty close to truth. I found the characters very Peter Shandy comes home from an aborted vacation to find a very nasty surprise during the Christmas holidays. How can Jemima gotten into the house? Was her death an accident? And what happened to the missing marble? This zany 1978 murder mystery is the first of the Professor Peter Shandy series. Set at Balaclava Agricultural College during the Christmas season, Peter tries to play a joke on his neighbors with his over-the-top holiday decorations. The murder of a neighbor lady leads to a silly series of events with many eccentric characters to keep us amused but ends happily with Peter meeting his soulmate Helen who likes counting things as much as he does. Much fun. Insta-love, ugh, but whatever. Balaclava Agricultural College is definitely a very interesting place. This series ought to be read in order. I'd read the second before I picked this up and it spoiled this one. This one's an old favorite, the funniest Christmas mystery I've ever read. I love this book! Do yourself a favor: at least read the hilarious first chapter. It can stand alone as a short story, & it's readable for free (completely included in the Kindle sample). RYM starts out with perhaps the funniest "Bah, humbug!" a likable fellow has ever committed, then proceeds to introduce a colorful cast of characters in a clever little mystery. I don't always like "quirky" cozy mysteries -- sometimes they seem to be trying so hard to be funny that you can't care about the p I love this book! Do yourself a favor: at least read the hilarious first chapter. It can stand alone as a short story, & it's readable for free (completely included in the Kindle sample). I don't always like "quirky" cozy mysteries -- sometimes they seem to be trying so hard to be funny that you can't care about the poorly-developed (and/or TSTL) protagonists, and sometimes the author seems to have written a "light" story because they lack the skills for any more -- but Charlotte MacLeod is a fine and even erudite writer. There are a few brief [literary] allusions which went over my head, although I appreciated the clever ones I did understand, and even if those ALL go over yours, you'll still find PLENTY to make you chuckle in the rest of the book. * the Max Bittersohn / Sarah Kelling Kelling Bittersohn (No, that's not a typo) Boston uppercrust mysteries. * the Lobelia Falls Grub-and-Stakers Gardening & Roving Club mysteries, featuring Dittany Henbit Monk, her Zane-Grey-wannabe husband Osbert, and his larger-than-life romance-author aunt, Arethusa. Perhaps it is with the knowledge that Charlotte MacLeod first drafted this as a short story, that I find the introduction weaker, detached from the astonishingly well-developed setting that unfolds. There is a smorgasbord of characters to digest, which is fine if one is on board with the protagonist. I relate less well to the male perspective, if nowhere near my lifestyle. At first, ‘Peter Shandy’ come across as a doddering, unmarried professor who appears out of synch with his peers. He overdoe Perhaps it is with the knowledge that Charlotte MacLeod first drafted this as a short story, that I find the introduction weaker, detached from the astonishingly well-developed setting that unfolds. There is a smorgasbord of characters to digest, which is fine if one is on board with the protagonist. I relate less well to the male perspective, if nowhere near my lifestyle. At first, ‘Peter Shandy’ come across as a doddering, unmarried professor who appears out of synch with his peers. He overdoes Christmas decorations in revolt against obligation to adorn his private home. We learn their university town earns income from tourism of “Illumination” festivities. The interference of neighbours seems inappropriate in the novel’s early stages. 'tis not at all the season for this book, but I was in the mood for a mystery and had never tried MacLeod. Fortunately, the holiday touches are merely the set up for a couple of murders, set on a fictional college campus near Boston. It will definitely not be my last MacLeod - I thoroughly enjoyed pretty much everything about this. And I only kind of managed to figure out the parties involved in the offing. I used to love this series so when the audiobook was on sale, I got it. It is full of outrageous people at a small agricultural college. I think I have worked too long in higher education because I found this all just plain silly. Plus the hero's love interest, a librarian was a little too demure and a little too perfect a love match.